Bofore some days I had a curiosity that what new features are added with C# and VB dot net in Visual Studio 2013 new version. I browsed from MSDN and got this surprised information about the new version changes in VS 2013. "As you can see in the VS2013 Preview, we have not added new language features to C# and Visual Basic in the next version of Visual Studio. I’d like to share our thinking on this. There are essentially two main reasons why we chose not to evolve the languages this time around." The most important is that we just shipped new versions of these two languages less than a year ago, with support for asynchrony being a major new and impactful language feature in both. Developers are still learning how to integrate and benefit from the asynchrony shift in languages and APIs. We are very excited about the quicker pace of release for VS, but we believe from experience that language versions need a little more time to settle in. Our current thinking therefore is that C# and Visual Basic should stay closer to the pace they have been on for the past decade. It’s a balance between providing stability and new value, and we feel like we already have that balance about right. 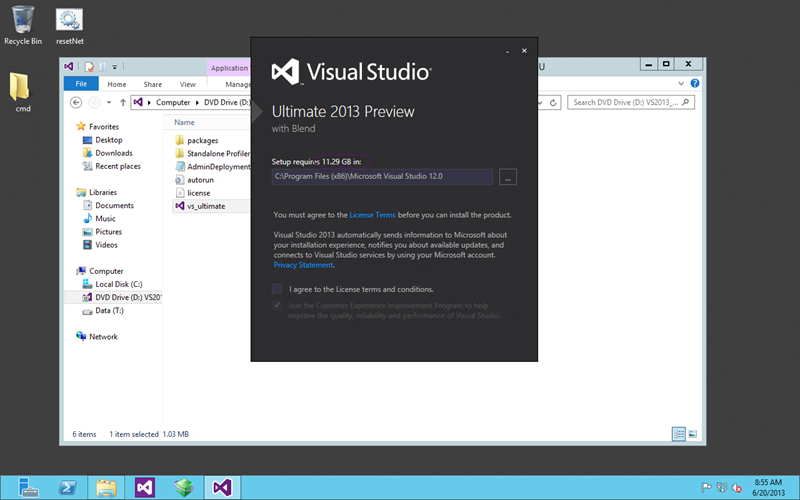 Install and try Visual Studio 2013 today and seize the future of development. There is a more tactical reason for us as well, which is that we are nearly done reimplementing the compilers and language services for C# and Visual Basic from the ground up. You may have heard of this effort as the Roslyn project, and there will be many end user benefits to this work when it ships. From our internal perspective on the language team, the new infrastructure makes it vastly easier to implement and test new language features with confidence, quality and great tooling. While the old compiler infrastructure is rock solid and supports VS 2013 beautifully, any effort we spend implementing new language features on it takes away from investing in the tooling, language features and compiler APIs that will power the future. We are actively working on the next versions of C# and Visual Basic. The language design team is in full gear, led by Anders Hejlsberg as usual, and we are considering lots of new language features, big and small. We are looking very much forward to sharing more details about this work as the ideas mature, and to ultimately ship these new language features in a future version of Visual Studio.